Marlene Miller joined the Amish half a century ago. She is a mother of 10 and member of a Holmes County Amish church. Marlene is one of the rare souls (perhaps 100?) who has joined the Amish, and actually remained in the church. 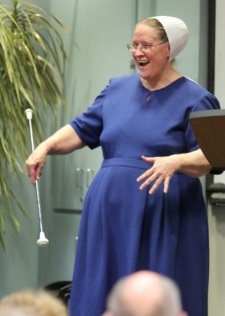 Marlene detailed her experience in Grace Leads Me Home (later republished as Called to Be Amish: My Journey from Head Majorette to the Old Order) and in an interview on this site. I liked the book. We’ve seen a few accounts of individuals leaving the Amish lately (see Ira Wagler or Saloma Miller Furlong). An account of joining the Amish by a person still in the faith is rarer. I asked an Amish convert once for an interview for this site, and was politely refused, a decision I could understand. At the same time Amish literary expression has flourished with more and more publications by Amish. Marlene is not afraid to share her warts in this book. If you enjoy raw first-person life stories you’ll like this one. Marlene made news again recently with a talk at a local library. The New Philadelphia Times Reporter covered the occasion. Here are some interesting things Marlene shared from her uncommon perspective. Miller said the hardest things about becoming Amish, for her, were learning to speak Pennsylvania Dutch and to sew. She buys bread because she never mastered the art of making light, fluffy loaves. A son who has been in jails and prisons for 20 years has been asking for books of Amish testimonials. “He wanted drink and he wanted drugs and he’d do anything for it,” she said. She believes she did the best she could to give her children a religious upbringing, with daily prayer and dinner-table instruction from her husband about the Bible. Even the Amish have been affected by technology, according to Miller, such as milking machines that allow one person to milk a whole herd. Given the chance, she tells younger women they should be with their husbands milking cows in the barn — together. I had a chance to visit with Marlene once at her home and found her a delightful individual. Her story is certainly an uncommon one. Read the article in full here, or our 2012 interview with Marlene, or check out her book. Erik, Marlene is a wonderful person. I had the pleasure of speaking with her a few times on the phone, when she first released her book, “Grace Leads Me Home.” She had a phone shanty and I had to let it ring and ring before someone answered, usually her husband. One of the things I appreciated about her book was her honesty and how living an Amish life was not all rosy, as one would expect. We know Johnny & Marlene well and have traveled with them. You’re right, Galen, she doesn’t paint this rosy view; she brings out the difficult side, too. She’s a very open and friendly person and I admire her outlook. How nice to read about someone joining the Amish. I just ordered Marlene’s book and look forward to hearing her story. I bought and read Marlene’s book when it first published. I was truly taken with all she (and her husband) went through to simply survive in their early days, let alone live “the Amish life.” I admire her tenacity and wish her all the best, as well as thank her for sharing her unique perspective as an Amish convert in today’s world. I’m glad she’s still making an impact in the world! As I was reading the above article, I came across her belief about the interference of government, “My biggest fear for my grandchildren and great-grandchildren is that they may become slaves to our government. Our forefathers died so they and we also could have the freedom to worship Jesus Christ.” That has hit home so deeply; my sons and their wives have all chosen a different path (1 atheist, 5 agnostic and 1 Wiccan). I pray every day they will come to terms with their lifestyles and allow Jesus Christ, Our Savior, to enter into their hearts. The government can not change a person’s religious beliefs. Only that person can. To blame America for someone’s loss of Faith insults not only our forefathers – but also America itself. The United States Constitution and Bill of Rights, along with our amendments – are the greatest freedoms the world has to offer. I pay taxes for nuclear bombs – I don’t want to – but I have to. I pay taxes for Trump to spend his weekends in Florida at his ostentatious compound Mar a Lago. I don’t want to but I am forced to. I pay taxes for lifetime salaries of Republican Senators – I don’t want to but I am forced to. But the Government has never taken away my Faith. Never tried to. Not once. Ren, my thoughts are with you. That must be difficult. I had to think of what I heard preached in our church not long ago. The minister spoke about how we as parents naturally want our children to share our beliefs & values and accept Christ and how it can be painful to see them reject what we believe and we pray for a change, BUT we tend to want that change NOW. He went on to talk about a couple whose child was living a very sinful life and the parents both died feeling very concerned and troubled. He went on to say they were both long gone before their child made a turnaround and accepted Christ. I guess the point I’m trying to make is our “timing” is not always God’s timing and we should never give up hope. I agree…God makes his Own time and we, in the flesh, must be patient. My oldest son will be 41 in a couple of months and my youngest son will be 28. It was after they left home that they decided to either follow their wives or go off on their own. So far my dils have not condemned me as the first gift I sent each grandchild was a children’s Bible, so hope springs eternal. Each time I feel my patience slipping, I try to remember what is a minute in God’s Eyes may be a millennium to us. Ren, I just prayed for you and your family. I know how difficult it is when someone you love is not a believer. I have to remind myself not to stop praying for them, and I ask God to bless them, because Satan and his lies cannot work where Christ is blessing. I have always found it difficult to understand how anyone can be atheist or agnostic in a world so full of natural and historic evidence for God. I think that anyone who doesn’t believe has probably not taken the time to sift through the evidence or doesn’t know it exists. There are so many great, intelligently written books that present the evidence for God and Christ, but many people aren’t ready. I do like Ray Comfort’s evangelical style, because it skirts the intelligence and goes straight for the conscience. His ministry is highly successful and doesn’t ignore the evidence. I love how easily he dismantles the theory of evolution. Sorry, I’m rambling. Anyway, at first I found it hard to understand how all but three of Marlene’s children had left their order, but as I thought about it more, it made sense. The Amish are growing so much and work takes them farther and farther from home. Hiring a driver can get expensive. I met a man who has a former Amish friend who is now a Mennonite. He came from the Westcliffe, Colorado Amish. He raises Clydesdale horses and had to hire a driver anytime he took the horses to a show in California (that part is beyond my understanding. Why would he be going out there? ). He had to pay for the transportation but also the driver’s food and lodging. I need to read her book. It’s no secret that I gravitate to almost all things Amish and once thought of converting. I’ve only seen one story of a failed conversion, (though I know there are many) a whole family that were Amish for years but who say they could no longer take the judgment of the church. They were always outsiders. I thought that was so sad and knew that would probably be me had I ever joined. Of course, that would have meant having a willing husband, learning a new language when I have trouble remembering to turn off the stove, etc. I’m happy for Marlene. She looks very happy. My, it’s been awhile since I visited this site and I’m so glad it is doing so well. I always find out and learn something new whenever I visit this place. Marlene seems like she can move mountains with her strength and faith. Regardless of the immense pain that has most probably afflicted her by her children – she does not give up hope. Trust in the Lord seems to be her mantra. The fact that might have had to go through an unkindness – or many – from others in her district when she first joined, and yet turned the other cheek, continued on with Faith and worship, loved her enemies, was thrown into chaos yet created order – shows that God called her and she answered, no matter how hard it was for her. I don’t have her book, so I am currently looking forward to reading about this strong, brave seeker who will speak nothing but the truth (how refreshing). I wish her the best of God’s blessings, I will pray for her and her family every night and then enjoy her writing soon. Seek, and ye shall find. That Marlene sought and found – is already a huge blessing. Why do Amish people choose to be Amish?